So you are in the market for a pro scooter? 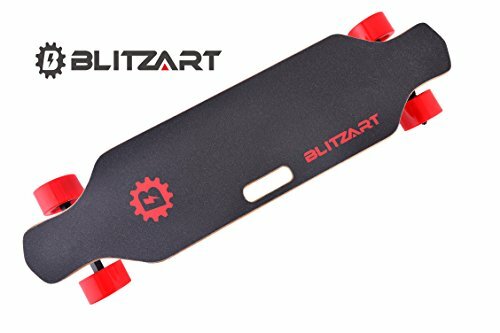 You want to buy a scooter that is made for aggressive riding and executing sophisticated tricks like bri flips, capron flips, umbrella whips, flairs and double flairs! Well maybe not double flairs let’s stick to tail whips and bunnie hops. You’ve been shopping around for the best buy but the high prices from the different brands has you slightly discouraged and all the scooters look relatively the same anyway. Why such price disparity? If any of the verbiage above strikes a nerve or describes your experience shopping for a pro scooters then you have landed on the right webpage! Pro scooters are quite complex not in overall design but in the various components and features available in the market today. However for a beginning rider many of these features are overkill and unnecessary. Your son or daughter might be dead set on a specific model that might be out of your price range but rest assured you can get a completely capable scooter at a price you are comfortable with. There is more than ever a wealth of great scooters at great prices available. Below is our curated list of the best bang for 100 bucks or less. All of these scooters have features that make them appealing for different reasons. We will walk you through all 5 scooters and discuss them in short to say if that scooter matches up with what’s important for your set of circumstances.Let’s tackle the list in the order we listed them above. 2018 FUZION PRO X-3 AMERICA'S CHOICE: Top selling pro scooter on Amazon. The PRO X-3 is lightweight, durable, and fitted with top of the line components. Fuzion PRO X-3 comes equipped with upgrades only found in much higher priced scooters. EASY PROGRESSION: The PRO X-3 is designed for entry level riders to help them build their skills while they advance to the next level. Fuzion scooters X-3 is probably the most popular scooter on this list and it’s what we like to call a “stunt scooter” or “trick scooter” and not a “pro scooter”. To clarify this point to us we consider a “Pro Scooter” one that is capable of handling professional level riding. While the Fuzion Pro X-3 is good for a younger just starting out in doing tricks and performing tricks in the driveway it is not a scooter meant for professional level riding. At best the X-3 mimics a pro level scooter but is more made as a gateway into aggressive scooter riding. Now this isn’t a poo poo on the X-3 at all for $69 there is no greater deal out there period. This scooter features a true box deck measuring 4 inches by 20 inches long and a set of composite core wheels (a much alternative to the cheaper plastic core wheels on comparable models). The Pro X-3 by Fuzion constantly tops the Amazon best sellers list because of its great design, solid construction and plethora of available colors. For us it gets no better than this scooter for under $75, many of the scooters including models on this list don’t compare to the X-3 by Fuzion Scooters. 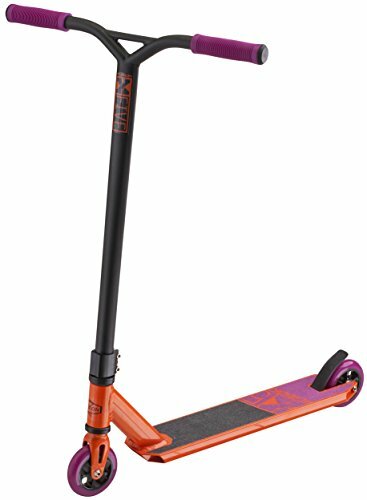 SKILL LEVEL: The Phoenix Pilot Pro Scooter is designed for beginner/intermediate riders. It is ideal for riders up to 5.5ft tall. Perfect for riders to grow their skills while they advance to the next level. 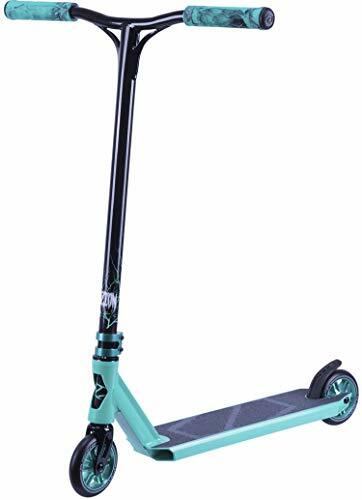  MADE FOR TRICKS: Coming in at a light 9.0 lbs, the Phoenix Pilot Pro Scooter was designed to help you master your next trick.  EFFORTLESS ASSEMBLY: Less than 5 minute assembly, so you can start riding right away. Dialed and ready to ride right out of the box. 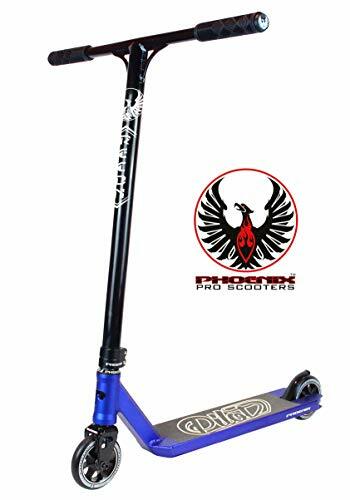 Coming up next is the Phoenix Pilot scooter, the Pilot is more in the realm of a pro scooter but still doesn’t quite measure up. 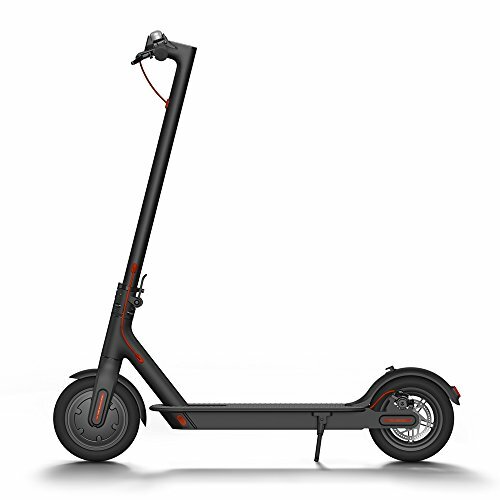 (*UPDATE) At the time of our original post this Phoenix Pilot was $99 which it barely made the cut off but recently the brand has decided to up the price on the Pilot to $129 which takes this scooter out of the running to be one of the best pro scooters under 100 bucks. Overall the Phoenix Pilot features a deck that is more suitable for pro level riding, the components are what hold it back from being a scooter that could be ridden competitively. Still this scooter has a whole slew of solid features like 110mm wheels ( the only scooter on this list with this feature), high tensile steel bars and ultra stylish “P” cutout in the headtube. 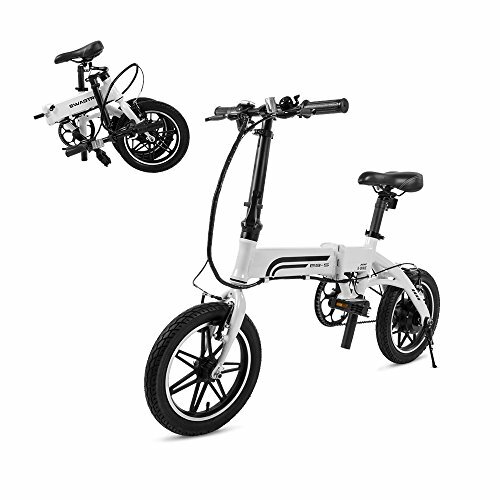 ️ GRADE-A COMPONENTS: The PRO X-5 comes equipped with upgrades only found in much higher priced scooters. Lightweight, durable and dialed right out of the box. With only three bolts to tighten you can start riding in no time at all. 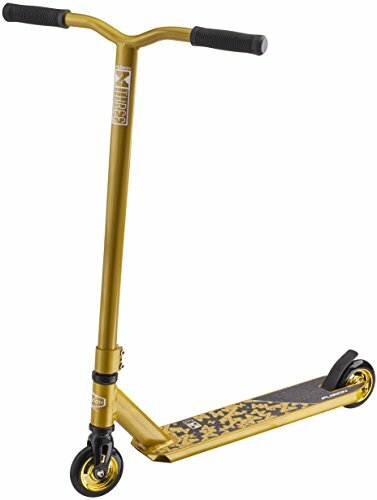  SKILL LEVEL: PRO X-5 is the ideal scooter for entry to intermediate riders. The PRO X-5 will take young riders to their next skill level. ALL NEW UPGRADED SPECS: 20" X 4" Aircraft Grade Aluminum Deck, New Fuzion 100mm Five Spoke Aluminum core wheels with cast PU, High Tensile Steel Reinforced V-Bars, and Fuzion's new Nylon/Steel Custom Brake: durable and noise-free.  DURABLE AND DIALED THREADLESS HEADSET: New super smooth IHC compression system with sealed bearings and Fuzion's brand-new 3D Stamped Steel FAZE Fork. Back to the Fuzion Brand the Fuzion Pro X-5 is our next contestant on the “best pro scooters under $100”. Consider the X-5 a Fuzion X-3 on steroids, really the scooters share the same foundation and deck but they different in a few key areas. First the handlebars on the X-5 are little bit nicer. The bars replicate the look of the YGW millennium bars just a little bit and feature a crossbar that in essence adds strength to the original design on the X-3. A major upgrade to the Fuzion X-5 is the addition of true aluminium core wheels. At the price point of $80 its unheard of that a company offers true aluminum wheels on a scooter. Even in 2018 most brands will throw a pair of plastic cores on and call it a day but not Fuzion! The desire to always deliver a bonus component at a great value is where they have carved out their niche in the last few years. Vokul TRII is up next, and Vokul is a prime example of globalization at it’s finest. Vokul is a brand that originated from one of the popular factories who produced scooters for some of the top brands in the scooter industry. Instead of stay in this lane they opted to go straight to market with the Vokul brand. Branding their scooters with bright colors and cool graphics has done them well and they are delivering a pretty good product at a good price point. This particular model the TRII features a reinforced deck measuring 4.1” by 20”, a high tensile steel fork and a threaded compression system. Wheels on this model are 100 mm and are composed of high density plastic. Vokul has done an amazing job creating a very visually appealing line of scooters but they fall a little short features wise. For the next rendition we’d like to see them step up to the plate and offer more value for the price point. The Vokul TRII features less premium components yet a higher price tag than some of the other scooters on this list. ONE DAY SALE!  BUILT TOUGH! What do kids love most about the Arcade Stunt scooter? They can ride it hard just like their heroes! And parents? It's one of the safest entry level trick scooters around! And that's because this pro scooter is packed with custom parts everyone loves. 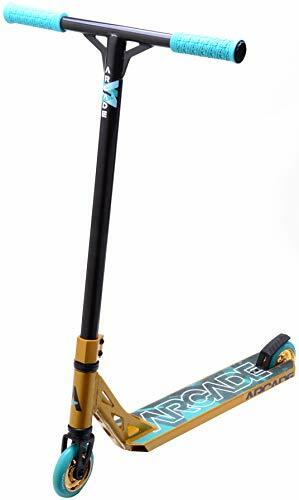 Strong 3D Stamped Forks, Custom Neck, Smooth Bearings, Solid Deck and Dynamic Design - the Arcade is built to take kids smoothly from beginner to pro. A STABLE, QUIET GLIDE: You can't glide with sticky bearings. Most entry-level kick scooters feature lousy non-rated bearings, but the Arcade Scooter is fitted with ABEC 7. We also wrapped our reinforced T Bars in customized 117mm TPR Grips and lined up an 83 Degree Headtube for a stable ride as you glide! We customized the fork and brake, so you could switch our 100mm Polycarbonate wheels for 110mm too! THE COOLEST KID AT THE PARK: While everyone else rattles around on other scooters, your kids will be whizzing around on their Arcade Scooter with its fresh graphics, smooth wheels and responsive brake. Because that's what a Stunt Scooter Kid in training truly wants - to look like their heroes! Racing Red, Brilliant Blue, Metallic Gold and Raven Black! Go ahead and choose your favorite color now. DIALED TO RIDE: We've heard the stories too, stunt scooters arriving damaged! So, the Arcade Scooter comes securely packaged to avoid disappointment. When it arrives, the only thing you need to do is tighten two bolts because the Arcade Scooter comes already dialed! Now, they may not be hitting big air right now, but we've given The Arcade a Solid One Degree Concave Deck (17.5" x 4") and IHC Compression for when they start. On to the steal of this list is the Arcade stunt scooter, for some reason the Arcade scooter is available for $59. Scooters like this typically retail for $120 and out of the scooters considered in this guide it is by far the closest thing to a legit pro scooter. 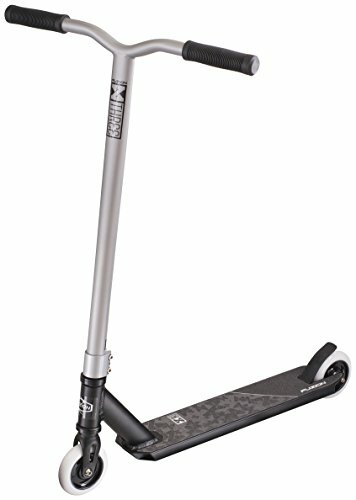 This pro scooter actually features a deck with forged styling ( a high end pro scooter trait) just with entry level components. 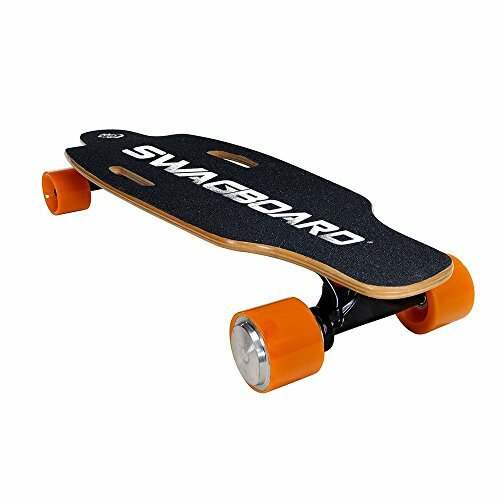 The Arcade deck measures at 4.0” wide by 19.5” long, these measurements are great for teenage riders. 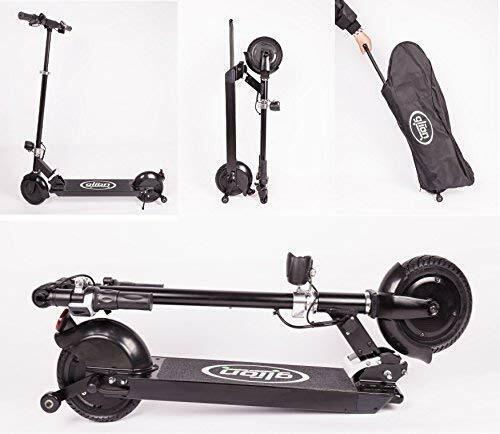 Really the main thing holding this scooter back is the bar height if a bar height of 22.8” is sufficient for your child by all means grab this scooter now while this deal is still available. 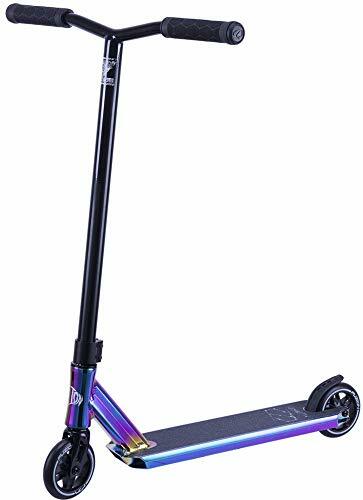 100mm aluminum core wheels, 4.0 wide deck, high tensile steel fork and the Arcade cool factor this scooter is a top pick. So there you have it, the 5 best pro scooters for under $100. Even though these aren’t true professional level scooters a younger rider will do just fine with any of these scooters to start with. If you haven’t been able to make a decision based on the aforementioned facts here are our picks based on budget. If you are limited to $75 bucks and under your best bet is the Fuzion Pro X-3 and sometimes you can catch the X-5 on sale for around $74.99. These are both super solid scooters that will not disappoint. Spending the Full $100 on your scooter?